In addition vitamin B1 contributes to the normal function of the heart. 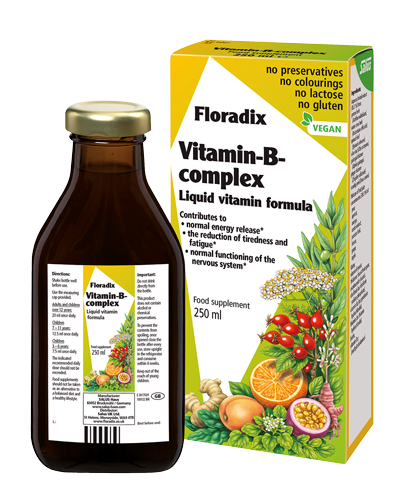 Vitamins B6 and B12 contribute to normal red blood cell formation and to the normal function of the immune system. Biotin and Niacin contribute to normal skin and psychological functions. Aqueous herbal extract (45%) from: yarrow herb (Achillea millefolium), water cress herb (Nasturium officinale), spinach leaf (Spinacia oleracea), olive leaf (Olea europaea), galangal rhizome (Alpinia galanga), ginger rhizome (Zingiber officinale), rosehip peel (Rosa canina). Mixture of fruit juice concentrates (38%) of: pear, apricot, orange, carob extract, passion fruit, lemon, grape, apple. Water, thickener: locust bean gum, nicotinamide (niacin), riboflavin (as riboflavin sodium phosphate), vitamin B6 (as pyridoxine hydrochloride), thiamin (as thiamin hydrochloride), biotin, vitamin B12 (methylcobalamine), natural flavours.